The SX 48/52 was (is) a monster chip (4K code space, 262 registers, 4 to 5 - 8 bit IO ports, 2 16 bit timers!) but despite all that it went mostly unused among experimental users. Why? I don't think it was the chip cost... they have been available for $7 to $12 dollars in single quantities. The available adapters or demo boards are either expensive or bulky and don't allow for the easy replacement of fried chips. Operation: 100MIPS (from a 4Mhz clock via PLL) at 5.5 Volts or 50 MIPS at down to 2.5 Volts. Speed instruction for on-the-fly execution speed changes. Sleep with independant RTC wakeup. Brown-out and watch-dogs. Price: $13.30 in quantitys. Offered (only) in an 80-pin plastic quad flatpack (PQFP) package. We need an adapter for this monster chip so that we don't miss out like we did with the 52. What sort of adapter can we make? What was available for the 52 and what can we learn from the mistakes? Can we avoid missing out this time? This image is an example of the sort of adapter I'm thinking of. Click on it to see it up close. There is a 48 pin PQFP pad set inside a 52 pin PQFP pad set and if you look outside that, you can see the three rows of pads and holes on each side for the test socket. The four large holes at the corners are the alignment holes and mounts for the test socket. The IO pins are arrayed around the edge and there are pads for Power, Master clear and RTCC next to the header for the ISP in the upper left. This layout was done using Express PCBs propritary layout editor before I knew any better (I'm much more software than hardware) and the layout parameters became more restrictive when they upgraded the software, makeing this layout impossible for them to make due to its complexity. Perhaps it's overly complex for anyone to make! It's only useable for wirewrap prototyping. The pads on the left and right sides should probably be rotated down inline with the pads on the top and bottom. It would make the board a bit larger, but small is no good if only a few people can use it. Perhaps both arrangements could be provided with the ability to cut off the ends leaving only the original arrangement when a smaller board size is required. It was done in a program that is not only unable to define and use library components, but which is also propritary to only one board house! It doesn't allow enough room for a chrystal or resonator, power regulator, or reset switch. This is an adapter (pn: 160-8404-07) I purchased from www.adapters.com some time ago. A great site if you really, really need quantity one of some wierd adapter that no one else can get. Its designed for the JEDEC MS026 footprint. Ubicom uses the MS022 rather than the more common MS026. Why? Because the MS022 is exactly half way between the standard MS026 used in the US and the package foot commonly used by the Japaneese. Splitting the difference allows the part to fit in assembly part handlers for either system. But for this adapter, the leads on the chip come down about half off the solder pads on the top of the adapter requireing that you manually push all the pins back against the body before soldering. Not for the faint of heart! The cost is about $65 They do not have an adapter with a socket for prices less than $250 each min qty 5. Its completely propriatry, and copyrighted. MUST support the IP2022, but that support can be SMD solder pads or via a test socket. Must be usable for breadboarding projects in a wide variaty of common prototyping systems. This requirement is sort of open ended, so I've come up with a point system for the different possibilities that probably does a better job of expressing what we might need better than any fixed set of rules. 30 points. Can be made by any standard board house. Gerber output. 20 points. Supports onboard crystal or resonator. 10 points. Editable in a freeware version of a popular PCB CAD system. 10 points. Editable in a GPL or open source PCB CAD system. Good luck finding one. 10 points. Usable with a whiteboard for prototyping. 07 points. Usable in a 28 or 40 pin DIP socket for prototyping. 05 points. Usable for wirewrap prototyping. 10 points. 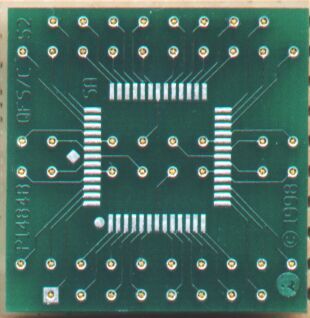 Standard 40 pin DIL Headers for ribbon cable connect to another board or right angle DIL or SIL headers / sockets for direct plug in to mother board or other boards. See "Maximum interconnect options from minimum board space"
10 points. Supports Dontronics SIMMStick format for as many port pins as possible. 16 data lines, 4 serial IO, 6 "address" lines. So maybe ports A, B and C on the SIMM side with D and E on another connector. Hint: There is a 30 pin SIL to SIMMStick adapter board available. You just have to have the SIL in the right order. 10 points. Supports RS-232 <-> TTL conversion. 10 points. Support Voltage regulator. 05 points. Supports onboard reset. 10 points. Breadboard area. Hint: Its ok if they have to cut traces to convert pin header pads into breadboard pads... just as long as its only one or two easy cuts. I'm working on a new board that may be of some use as a starting point. 8 RES Reset In or Out. Active Low. We feel the most misused, abused, and never used pins are the clock lines. Should never have come out at all. The guru did make a mistake here. As we redesign boards, we will remove these tracks, but it could be years now of course before it filters through. Have added the alternative pin designations A4 and A5. Scenix Micros use the clock lines for programming, so these may need to be routed via the "A" lines or perhaps a programming header. For SPI Operation, an additional I/O is required for the Chip Select of each SPI Device. I hope you or a partner can further develope a breadboard solution for IP 2022.